A few years ago, I had an exciting experience working in a pioneer area among the Maasai people. Since this was a totally new area for Christian work, I had the opportunity to try my own approaches – and make my own mistakes – rather than building on someone else's previous work. I was able to implement my approaches and ideas, using indigenous community networks for establishing and expanding the work. And the Maasai Christians were able to develop and express their faith in natural, fresh ways appropriate to their cultural background. I had some contact in the area in 1971-73, assisting Dr. Gene Moore in some periodic mobile clinics and carrying water to villages during drought. 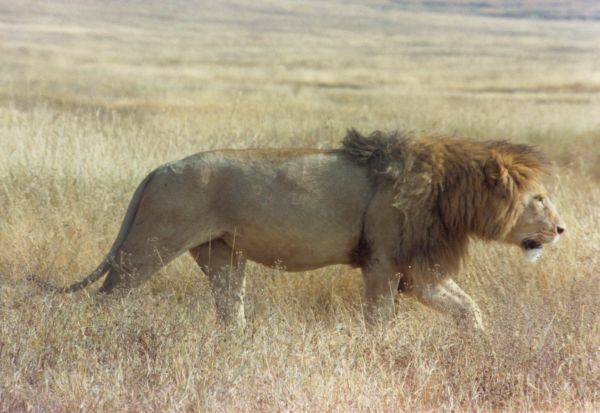 Since that time, great numbers of people had moved into the Suswa area of the Rift Valley, occupying areas that were hunting blocks and open plains when I was first out there. Mt Suswa is the dominant feature of the landscape. During this period no active church planting had been conducted by any denomination, though periodic evangelistic teams would visit the area. My reintroduction to the Suswa area was facilitated by a new missionary in my language-culture training program at the time. He told me that on a drive in the area, some people he met at a trading centre said they wanted someone to help them start a church. He and another new missionary went back to visit the people in two villages. After going with them to survey the situation, I agreed to begin working with people in Oloirowua and Enariboo. My approach was simply to visit and build relationships, learn about the people, their needs and ideas. I introduced myself as a missionary, a teacher and indicated I would like to share God's word with them. It was important to meet the village leaders and confirm their invitation, understand their desires and discuss expectations and possibilities. I soon realized that these people, though inviting us to “start a church,” had no real idea what this involved. But over the years, from early contacts such as those I made with Gene Moore, these people had come to have a positive enough concept of “the church” to want one. The relational aspect was easy and fun, and quite rewarding being the recipient of the Maasai's generous spirit and hospitality, as well as their protective loyalty extended to me as their new friend. The work was in making clear from ground level who Jesus was and what it meant to follow him. I found that in most cases people I spoke with were really hearing the Good News for the first time. I realized this was pioneer work in the most basic sense. I could not assume any Christian background, even in terminology. This was an exciting opportunity, and an awesome responsibility. I realized that whatever I said was likely the first direct knowledge they would have about Jesus Christ, the Bible, the good news of God's love and the meaning of a new kind of life through faith. They were open and ready, and without any background to prepare them or prejudice them. But this was just what I wanted – no misguided foreign traditions or transplanted institutional patterns imposed. I visited villages where they said I was the first person to ever tell them about Jesus. I was even told in some places that I was the first white person who had ever visited that village! This surprised me, only a few miles off the only road in that part of Kenya, heading towards one of the major game parks. This was only about a two-hour drive from Nairobi, a city of almost 2 million people! I remember talking about the birth of Jesus the first December I was out there. I asked the group of about 30 people gathered under the tree at Oloirowua if they knew what Christmas was. Three people raised their hand. Two individuals decided they did not actually know what it meant. The third one answered, “Ni sikukuu,” Swahili for “It is a holiday.” None knew the story of the birth of Jesus. This was really basic work! What an opportunity! So I had the privilege of apparently being the first to tell these lovely people how God had loved the world so much that he sent his own son as a human life to show us the way to fellowship with Him! I had read a book by Vincent Donovan a few years before that gave me some insights into the Maasai in addition to my earlier practical experience with them. In his book Christianity Rediscovered, An Epistle from the Maasai, Donovan details his experiences and discoveries in evangelizing the Maasai in Tanzania. I was impressed with the evangelical tone of this testimony by Donovan, a Holy Ghost Father with the Roman Catholic Church in Tanzania. As I actively observed and evaluated my early interaction with the Suswa Maasai, I also found that my own assessment was similar to his. I was committed to as indigenous a presentation of the Gospel as I could manage. In this context, it seemed important to me to present Jesus as a real person with a tribe, a history and an ethnic identity. This is how most African peoples think of any individual. I spent a lot of time with my Maasai friends just exchanging culture, talking about how each of us grew up, what my country was like in contrast to theirs, concepts of family relationship and responsibility, and those things important to a people who have a strong extended family community. Since the gap between God and man, the separation from God, is a common traditional theme among African people, this reconciliation message in the Gospel often makes direct contact. I presented the possibility of renewing that closeness with God through Jesus. Similarly, the work spread through the natural social networks of the Maasai extended family. People I knew would ask me to go with them to a village where they had been talking to relatives, to lead a prayer service, or witness to them. I was led to a new work by the believers. The cultural network already in place became the network of Gospel emanation among the Keekonyokie Maasai in Suswa. The Maasai are very religious people, aware of God, devoted, open to spiritual dimensions. For example, I found they always have traditional prayer in their baraza, the meeting of the elders. When we had some of our early community meetings, I remember that elders would pray in the traditional Maasai prayer form and we would pray in our traditional Christian form. I learned that they had a traditional prayer closing formula, the word “Esayi.” This means basically the same thing as our “Amen:” May it come to pass. We used this word to close our prayers and affirm a word of faith or testimony, as well as using Amen at times. The substance of worship for the Maasai, as for all African peoples, is in expression and experience, not performance or reciting of prescribed word or proposition. Faith is understood in terms of relationship, not knowledge, just as it is in the Bible. I found the Maasai, as many other African people, were better able to understand this than the more empirical Westerners, for whom values of analysis and linear system organization are primary. View Larger Map Mt Suswa, to the left, west of the Nakuru Road (Transafrican Highway) from the turnoff heading west on the Narok Road going on to Maasai Mara Road. 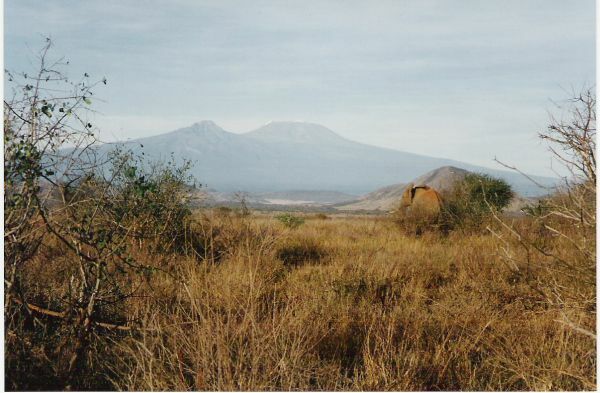 The smaller mountain to the north is Mt Longonot, which has been made a National Park sicne we were there. 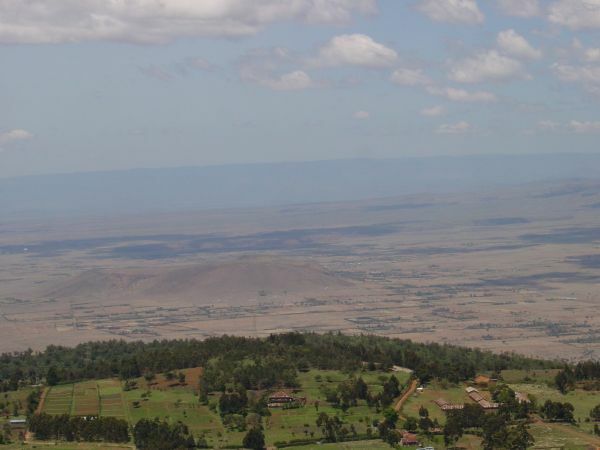 To the west of Longonot, north of the Suswa area, is Hell's Gate National Park in the Mau Narok mountain range. Hell's Gate is a natural hot springs area with steam rising all the time. They could understand the offer of reconciliation through Jesus Christ. It seemed to make the message more real when we talked about who Jesus really was, when we talked about the people, the time, the culture and the message of Jesus as a real person. It is interesting to note that the earliest doctrinal controversies in Christian history were not over whether Jesus was divine but over whether Jesus was really human. The early creeds affirmed that Jesus was truly human, fully human. The doctrine of Incarnation was seen as critical. The Maasai were thrilled that God had revealed himself in a real human life. This must be what first-century people felt when they realized that Jesus was not just another demi-God hero of the Greeks, not just some divine appearance of the Persians or Hindus, but a real person with a family, a language, a culture and a life, just like them, and yet uniquely the Son of God who had come to bring the divine reconciliation in God's love. Jesus made sense to them! It was not just a religious concept, or a new doctrine. It was a real life-option! It seemed that the Maasai really knew what it meant to experience God's forgiveness! They seemed to really understand grace. The message meant so much to them that they would go to their relatives in neighboring villages, climbing up on Mount Suswa and the Mau Narok escarpment to tell what they had discovered! How exciting to be a part of that discovery for them! The Lord sent me a helper from over the Mau Narok, near Lake Naivasha. Peter Kitasi had become a Christian through the message of a travelling evangelist, which sank into Peter's heart and mind. His faith in Jesus delivered him from drunkenness and depression, and gave him a zeal for the Lord's will. The Lord had sent a Kenyan Kikuyu missionary from another town to him looking for direction to the house of a man he had business with. He heard Peter's testimony when Peter invited him into his room for tea, and then baptized Peter, who had not heard of the need for baptism. But Peter had no church. When he heard that a Christian missionary was visiting villages over the Mau he walked several miles over the escarpment to seek me out one Sunday when I was there. From the beginning we would sing songs, as all Christians do. Peter would “conduct” the service under the “meeting tree,” leading the group in singing what Christian choruses he knew. He encouraged the gathering of Maasai songs and we were able to get some Maasai song collections that had been published by the Africa Inland Church and the Christian Missionary Fellowship working in other parts of Maasailand. Our worship services would consist of singing several choruses or hymns, a lot of praying and one or more lessons from scripture. As believers developed, testimonies became an important part of our meetings. In later years, after I had moved on, I heard that Peter had lost himself again to the mastery of alcohol. I never saw him again. Where the “sermon” would normally occur, I would present a lesson in discussion format. I normally taught by dialogue, asking questions to set the stage for a point or help them draw conclusions from the stories or questions under discussion. In this way I could be sure I was communicating with them. My oral communication was initially in Swahili, using young interpreters who helped. In the first village, many of the people, even the women, spoke Swahili, so this helped me check their understanding. I learned key phrases of Maasai as I worked with them, and could do some basic teaching in their own language. I regret that I never became fully fluent in the language. I was involved at Suswa only over a period of three years. This was a secondary assignment in addition to my full time assignment, and additional part-time international responsibilities. I had insufficient time to work adequately on language communication. I continued to learn as I could and use everything I learned every chance I got. I was initially driving out to spend all day Sunday about every three weeks. I visited at other times as I was able. But by the end of three years, it was at least three Sundays a month plus additional visits during the week when I could manage it! I expended my efforts on interpersonal relationships and culture learning, with what language I could. But even today, I still know how to say “We have arrived:” “Kitabautua!” I used that every time we ended one of our long treks between villages! My Maasai friends and brothers were gracious, warm and encouraging. One of the resources I used was a flip chart of Bible story pictures, obtained from Gospel Recordings. The pictures portrayed key Bible events from creation through the giving of the law, through the stories of the heroes of Israel to the Gospel events of Jesus' life, ministry, death and resurrection. The stories were a format familiar to African people. We left copies of this resource with individuals in each village, so they could tell and retell the stories. I had not been introduced to the technology of “Storying” at that time. But the storying approach seems similar to my method. In addition, I explained what it means to be a church by telling the stories of the events of Holy Spirit ministry in people's lives, as recorded in Acts. Stories fit the sophisticated traditional communication and education patterns of the Maasai. I provided one of these charts for some of the young men who had expressed a calling to be an evangelist or pastor. I obtained the accompanying message on cassette and some hand-wound cassette players which were used by these men to play these stories in the Maasai language. This was one form of discipleship for the evangelists (the Gospel storytellers), who were also new believers. It was also a way of enabling the people to hear the Bible stories in their own language. They could also listen to other cassettes, some Christian and some non-Christian, I imagine. I know Peter had some Maasai and Swahili Christian choruses on cassette that he played on his machine. One important principle for me was that any technology or method introduced should be locally sustainable. That is, after I or other foreign partners left, what was used could be supported and sustained by the local people. They were familiar with music cassettes and radios, and could buy batteries at the trading centres along the highway or in the town centres. While the expense of the machines themselves were more financial outlay, the Maasai were not poor; they had goats and cattle. And they had the initiative and the organizational skill and commitment to determine what and how they would obtain and maintain what they wanted. As individuals and families began to express their faith in the Lord, I imposed no preconditions for acceptance. I placed no requirements on their culture, dress or family setups. I believe the Lord called them as they were, and I trusted the Holy Spirit to lead them as believers to make the appropriate adjustments in their personal and village life. I made no judgements concerning socially valid candidates for baptism. All who made confessions of Jesus were baptized, in the New Testament pattern. I baptized all confessors including multiple wives. Baptism upon confession was tied to faith, not to knowledge. We baptized believers, then taught church members. Sharing the Good News (Evangelism) was presented as the Christian lifestyle from the beginning. The Maasai were slow, methodical and serious in their active consideration of the Gospel message and the claims of Jesus upon them. They listened quietly but intently, asked serious questions, and deliberated in their own way. When they made the decision to believe, they were firm and faithful. As soon as possible, the Maasai Christians themselves were deciding who would be baptized and doing the baptism. At our first baptism I asked Peter to baptize some of the new believers. I tried to follow the new Testament pattern of a “lay” church. Believers winning and baptizing new believers: churches starting new churches – an indigenous movement. Conversions were usually expressed in two ways. First, a family leader might individually express his confession of faith to me in direct witness. Then shortly after he would come to me to state that now his family (wives and initiated sons) were also believers. Second, a variation of this pattern occurred when the leader would come to me with his wives and family, or speak with me while I was having tea in his house, and report that now his village (family) had decided to accept Jesus. This is a common patterns among concrete-relational cultures. The core of identity is the lineage group or family, not the individual. Relational values that foster group solidarity and unity are strong. Thus these values determine decision-making patterns in a society. The highly individualized sense of identity in detribalized Western society is unusual in its focus on the individual. The negative aspects of this radical individualism is expressed in the Western social maladies of loneliness, disaffection and destructive competition. The new generation has responded with a renewed focus on community and cooperation. The high relational and interpersonal values of the new western generation reclaims a basic value in our common human heritage: being a responsible member of a social group. When a Maasai family or village would express their faith this way as a group, upon discussion with them as a group or individually, I always found the faith confessions to be valid. As valid as a human witness can verify, anyway. I did realize that their almost total ignorance of the scriptural tradition showed up in their way of expressing themselves. But this actually seemed to me to confirm the sincerity and validity of their confession. I saw this as a strength, not a weakness. I heard the confession of faith in their own natural terms! How refreshing. How authentic do the standard, canned denominational “testimonies” sound? I felt I was a witness to the first-century sweeping movement of the Holy Spirit in a new people! I remember coming to Oloirowua one day and finding the women in an uproar. Some of the people explained that there was a traditional meeting going on and the women of Oloirowua were refusing to go and were upset because some of the other Maasai women had gone. This was an annual ceremony where all the women of child-bearing age went up to a special camp with a medicine woman to ensure their fertility. I had never mentioned anything about any traditional practices. But these women had come to their own conviction that they should not be involved in this. Their testimony was that they were followers of Jesus now. If He wanted them to have children they would have them. While this may be seen as naïve from a scientific Rationalist perspective, it aligns the new view of the Christian Maasai with the “scientific” view in rejecting the traditional fetish practices, but with a faith dimension. And their men supported their decision. This was the women's cultural domain, and the men acceded to the women's convictions here. This kind of decision occurred periodically as these new believers followed their faith and made the decisions when the questions came up. This was important to my approach. It was satisfying to see it really was working! I did not just bring up ideas from the outside, or suggest cultural changes. I just facilitated their exploration of faith. This confirmed my conviction that the Holy Spirit did indeed work with new believers just as the New Testament said, and just as he did with more experienced believers! I determined to conduct this work without outside money. The outside resources I provided were myself and my car – to get me from place to place and offer rides for pastors or members as possible or necessary. In addition, I used some personal tithe money to provide two or three tape recorders and some small booklets I used in our leadership classes. I provided no money, made no suggestions of assistance and took no initiative in putting up buildings or developing church officers or associational organization. The local leaders decided when they wanted to build. I let them decide where to build. I remember when the folks at Oloirowua first mentioned a building. I said, “Yes, that is something you can think about.” And we left it at that. As the matter continued to come up, it finally came to the point of serious discussion, still at their initiative. I asked them questions: Why do you need a building, how will you pay for the materials, how will you get them transported, who will do the work of construction, who will take care of it, etc. This helped them to think through the steps necessary to implement their desire. I offered no resources. I assumed we would build from local resources. I used each question as an opportunity to teach specifics of the principles of local church autonomy, stewardship and self-support. I pointed out that the only money Baptists have comes from offerings of individual members from churches just like theirs. So that is where we start looking for resources. This was to be an indigenous community of faith, an independent church. I wanted to avoid the paternalistic dependency syndrome traditional missions so often developed. Dependence was a destructive syndrome it was critical to avoid. The financial paternalism of western missions – liberal or conservative – had left “dead bodies” all over Africa. The Maasai are good organizers when they decide something needs to be done. I helped them with the practical steps. We gradually considered possible resources outside their own church membership. Partnerships are a positive Christian principle. I made sure they had considered every aspect of the project before we discussed, for instance, the possibility of a partnership gift from the Baptist Mission to put on the roof. This seemed to work. They came to understand that the “mission” was just individuals like me from churches like theirs. In the end, we did get the mission assistance for the roof, and volunteers, some Kenyan and some Virginian, helped put the final building together. All other churches in the area were built locally. A few also received roof assistance from the mission. 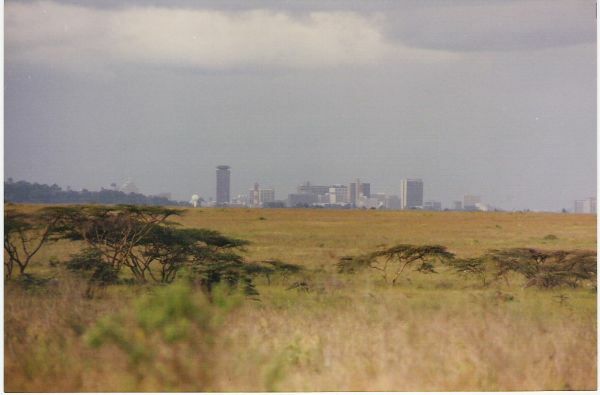 Nairobi, Kenya, viewed from the Naiorbi Game park, a few miles south of Mt Suswa. Be sure to mouse over the photo for more details. From the beginning, I made my role clear. I was a teacher, not a development worker. I could assist them in learning about Jesus, in starting a church, in learning how to be Christians. We would depend on community resources for our planning together. In this way, I think we established the principle that the identity of the church is in its members and the community where the church meets. The meeting place was often under the traditional conference tree in each location. (We got permission from the local chiefs for meeting in this “official” community meeting place.) Meetings might be held in a local school in the more developed towns. We might meet in homes. The church identity was clearly in the members meeting together. The resources were those the community of believers could gather. I was encouraged that the people themselves would come up with ideas like a systematic way to take the Gospel to neighboring villages, or what officers to have when we got to the point of organizing the church association. The leaders decided themselves at their second annual association meeting to appoint persons responsible for various areas, such as evangelism, music and youth. At no time did the missionary suggest the organizational aspects of these ministries. But from the very beginning these areas of need were focused on, and the local members and leaders were encouraged to consider how these needs could be met. I remember that even at our first associational meeting, some suggested that each church provide some money for the pastor of our first church (just a volunteer, only a young Christian himself) to visit other villages as an “associational missionary” to encourage other groups or start new groups. In finances, I remember repeatedly giving practical illustrations. Financial stewardship had to make sense in the cultural context. For instance, the culture of Maasai centres on cattle, but the major “disposable” wealth is goats. I suggested that when they take some goats to the market, they take an extra one and sell it for the church. When the question of resources for some need came up, I would ask them to think of ways they might meet that need. I helped my friends calculate the cost of what they wanted in terms of goats they would need to sell. Some of the most spectacular features of the Great Rift Valley are in Kenya. CLICK PHOTO to enlarge the map. We started from the beginning taking offerings which would be used for various needs in the church. It was strangely easy to implement the idea of record keeping. I was surprised that even the standard record books (published by the Baptist press, with carbon copies for reporting) were accepted and even used! The Maasai like to be organized. Sometimes Western record-keeping and planning does not fit the less analytical, more relational African cultural preferences. But they liked the new tools for planning and management. Each group decided who would keep the money they raised or contributed. The missionary was not the treasurer. After six months of initial contact, we held our first baptism in the first village where we had begun. By his time another group had begun on nearby Kedong Ranch, led by a young new believer who had made contact with some people in our first village. We baptized 35 people the first week, and the next week 15 more, some from the nearby group. We now had churches at Oloirowua, Kedong Ranch and, shortly after, at Enariboo. When we held a baptism, we considered the church had begun. We started a membership roll with the names of these first baptized. We did not have any further formal “organization.” The church was a simple body of baptized believers (the standard Baptist definition). From this time on we had periodic baptisms, when it rained or when we could get to a watering trough with piped-in water. It rained only for a few days two times a year – in the good years. One year from our first baptism, we had an association of seven churches of this sort, with about 300 members. The Suswa Baptist Association was accepted as a cooperating association of the Baptist Convention of Kenya. I led the work in Suswa for three years. Meanwhile, I gained an assistant, who finally “took over” the work as the assigned Church Developer. Herb Cady had come to Kenya with his wife Becky to work in an assignment as principal of an MK school in Nairobi. Entry Orientation in Kenya involved ministry with a church or association as part of language and culture learning. During their entry orientation, while learning Swahili, Herb and Becky participated in the Suswa work as their church field. Herb went with me regularly, and the Cadys, as well as other new missionaries, learned to lead worship and present their Christian stories in Swahili in Suswa churches. The Suswa area was a convenient added dimension to the cultural entry orientation program I directed. Following the requirements of my (Southern Baptist) International Mission Board, every missionary in the Baptist Mission of Kenya is involved in some aspect of church development work, no matter what their primary assignment is. Herb decided to continue working with me in Suswa as his church development field. This made a great partnership. Sometimes we would go together, sometimes we would visit different areas of the association on Sundays. We both were involved in planning meetings as possible, and Herb, using Swahili, became very effective in his work and personal relationships with the Keekonyokie Maasai of Suswa. After Herb had worked about one and a half years at Rosslyn Academy, he felt he should transfer to full-time CD work. He too had fallen in love with the Maasai! He and Becky were approved for transfer by the mission, and he began working full time with them. Though still working part time, I officially was still “in charge” of the work. That did not make much difference, however, because of the way Herb and I handled the ministry. It was a partnership between us and with the Maasai Christian leaders. We each fully involved ourselves, conferring regularly on the overall work, but handling different aspects of the work. I continued to keep the “official” records, like church membership rolls, for mission reporting purposes and for training the leaders. Herb took up more and more of the contact work. I conducted the leadership development seminars, which included basic Bible teaching and doctrinal backgrounds. These were conducted, however, in the same discussion format with which I had begun my evangelistic teaching in the villages. In this way we decided as a group about matters such as church membership, transfer of membership or baptism of members of other denominations. These leaders considered how to administer the Lord's supper and the appropriate “elements” for that desert setting. We looked at what are called the gifts of the Spirit. These Maasai leaders considered what that would mean and how that would be expressed in a Maasai cultural setting. They considered the question of cooperation with other Christian groups and other questions that came up as we dealt with scripture and practical questions. Herb was good at handling matters like requests for roof assistance and transporting and supervising the project evangelists. I enjoyed working with both the Maasai believers and Herb, as we all learned together. It was a pattern of partnership discipleship, not the paternalistic pattern I've seen or heard horror stories about, where the missionary controls the church, the study, the decisions, the money, everything! During this period, Herb and I served on the committee of the Maasai Project, a Baptist program to reach into every area of the Maasai people in Kenya. The Maasai population of Kenya was about 450,000 at that time. Two Maasai believers would visit in an area, teaching for a week, baptizing new believers who confessed faith in Jesus, teaching them another week, and doing discipleship for new leaders. This followed a similar pattern I had used in starting the work in Suswa, but the contact period was compressed. New believers became a new church when they were baptized. This new church became a cell group for reaching out into the community through their extended family relationships. Through this project Maasai teams attempted to take the Gospel to every Maasai home in Kenya. In 1993, 85 believers were baptized. Herb reported that in the first seven months of 1994, 137 had been baptized. Herb implemented a new water project, crucial to life in the great drought of 1992-93. Exciting spiritual developments are still occurring. It was exhilarating to start totally new work and to see the Holy Spirit truly work in new believers who took the Gospel seriously. I believe that my attempt to use indigenous community structures and leadership forms worked. The new believers asked questions and explored answers, identified needs and problems and developed solutions from their own material and spiritual resources. God, enriching the worldwide church with their new, unique contribution. It was fun! But it was uncertain. And it was hard work. It was a safari of discovery. I enjoyed watching the Lord present solutions as we discussed things together. I tried to preclude no options, but rather to help them look for God's solution for that time, place and culture. We always looked at what the early church decided. We always looked at what Paul told the first churches. We always struggled to find the basic principles we should and could apply to our situation, and to determine which instructions were for the unique situation of the first churches in their own cultural setting. These serious believers took the task seriously and grew through the process. God did lead them to valid Gospel solutions, appropriate to that setting and culture. Sometimes we came up with similar ones to those I knew from European or other African settings, sometimes different. But the missionaries did not decide. We tried to draw upon our long experience and knowledge of possibilities to facilitate and advise as they searched for their unique concepts or practices. It was helpful to me to go all the way back to the beginning – no traditions, no culturized Christian concepts – back to the basic good news. The New Testament was a live and immediate witness and a guide to these new Christians who were learning the message and seeing the possibilities for the first time, and becoming the Church of Jesus Christ as we watched! I felt this evangelical experiment in indigenous mission approaches was successful.